*2007 Great Taste Award Winner* The vampire strikes back with this plum & habanero chilli combination that will certainly stimulate the endorphins. A Garlic Farm favourite is locally produced pork & stilton sausages & onion mash. 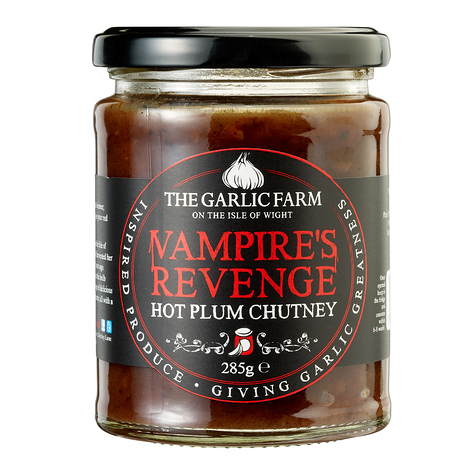 Let Vampire Revenge give your red meat dishes a subtle, but satisfying kick! Plum (53%), Unrefined Raw Cane Sugar, White Wine Vinegar (sulphites), Dried Dates, Sultanas, Garlic (3%), Spices, Black Mustard Seeds. For allergens see ingredients in bold.